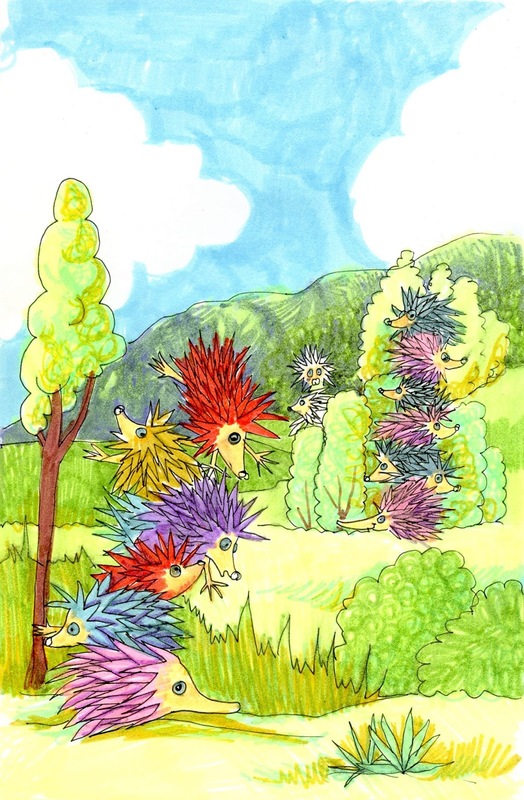 The Friday Fun & Easy Landscape Challenge 3/2 -3/8: Draw a landscape using either the Hedgehog or Echidna step-out or both. Extra calorie-free brownie points for use basic shape plants and scribble texture. I was working on a Hedgehog step-out and earlier this week I drew an Echidna for my hubby’s lunch bag, and I thought how similar the two were. And then I had the thought – it’s almost Easter, and Echidna’s lay eggs! One of only two mammals in the entire world that lay eggs. So if you’re trying to think up ways to change up those boring old Easter cards, how about you have an Echidna bring your Easter basket? It actually makes more sense than rabbits, lol. My Hedgehogs and Echidna don’t have feet or ears. Well, they do, but they keep them tucked in unless they are using them. Let your unique flag fly! Every plant and animal in the world is unique and so are you – so your drawings should be too. 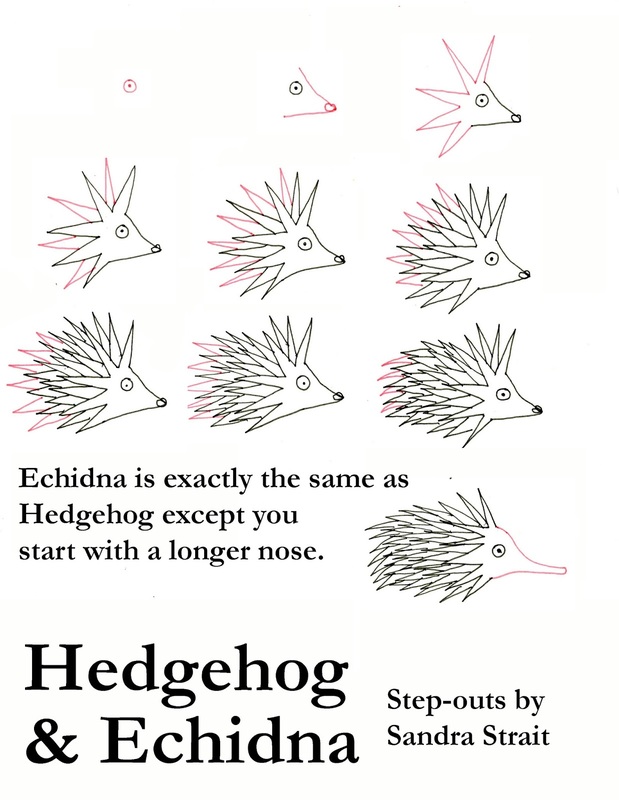 Don’t try to make your hedgehog or echidna look exactly like mine. Experiment with the length and width of the spines. Change the eye and nose. HAVE FUN! In my Fun & Easy world, Hedgehogs and Echidnas come in bright colors. They like to play a game where teams climb on top of each other to form towers. Echidnas are always on the bottom because their long nose provides more stability (people don’t realize that about the Echidna nose, lol). The team that builds the tallest tower wins. I think the team in front is in trouble!